UPDATE: The trailer has been released and looks epic. It all started with a leak. Achievements were leaked for a new Dragon Age: Inquisition DLC. Of course, that meant that EA had to confirm it, and give us some details. I’m still waiting for the trailer for this DLC, but here’s what we know thus far. 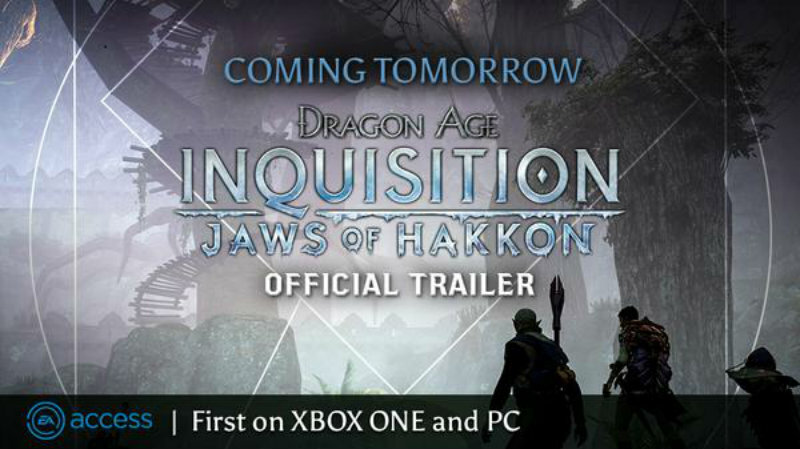 What does Jaws of Hakkon include? Well, apparently there’s some new gear, new enemies and a new region, as well as four new achievements. Firestarter (15) Destroy all the Winter Shards and light all the fires in the Old Temple. Legend-Marked (30) Impress the Avvar of Stone-Bear Hold and gain their friendship. Historian (30) Uncover the secrets of a legendary figure. Winter’s End (90) Dispel a myth of ancient days. I really loved my time in Thedas. Dragon Age: Inquisition isn’t a perfect experience, but it’s a pretty awesome one nonetheless. This might just be the reason for me to jump back into the game and see what the DLC has to offer. If nothing else, it should boost replay value. Then again, I have review games to play and the universe to save in Helldivers. Still, I have to play this DLC, if only for research purposes. Right? I want to see the trailer – here’s hoping it shows off some wow factor that makes me excited to play it. Still, I’ll have to wait for the DLC to make its way to PS4. But it would be nice to be hyped for more gameplay. [Update] The trailer went live and it is looking rather dramatic. Why stop with taking on a big bad who likens himself unto a god – take on an Avvar god and save the world. Again. This DCL is looking rather large and dramatic, and considering the scale of the story it should (hopefully) add a few hours of gameplay. And just like that, I’m drawn into buying DLC – at least Bioware makes it feel worthwhile.